The ShortNorth.org blog highlights the happenings of the Short North Arts District. In Art Spotlight, we feature the artists and gallerists of the District and explore their exhibitions, artworks, and more. If there’s one thing Tariku Shiferaw is doing, it’s making a mark. Many marks, in fact – on canvas, on art history, on a gallery wall, on an arts district. His most recent body of work, titled One of These Black Boys, “explores mark-making in order to address the physical and metaphysical spaces of painting and societal structures,” according to his artist statement. We talked to Shiferaw, who is based in New York City, to learn more about the various ways in which his work makes a mark. Shiferaw is the titular “plus one” in SIX PLUS ONE, the annual group show at Hammond Harkins Galleries, which opened its third iteration on Friday and includes several of his most recent Black Boys pieces. The idea of the exhibition is to “bring together artists who otherwise wouldn’t have a chance to exhibit together,” said Chet Domitz, the gallery’s art consultant. Previous “plus ones” Laura Bidwa and Melissa Vogley Woods, who are both now gallery artists, are also featured in this show, along with Andrew Hendrixson, Andrea Myers, Kaveri Raina, and Alteronce Gumby. It was fellow New Yorker Gumby who helped form Shiferaw’s introduction to Columbus during the gallery’s September 2018 Harlem Renaissance exhibition, To Dream Avant Garde, which Gumby guest curated. Though Shiferaw did not make the trip to Columbus for that show, Gumby selected one of his pieces for inclusion. “We had such a positive response to [Shiferaw’s] work, we decided to ask him back,” said Domitz. Similarly, Shiferaw is glad for the opportunity. “The amount of respect this gallery gives to the artist – [it’s a] mutual respect,” said Shiferaw. It’s not hard to see why the gallery received such interest in Shiferaw’s work. His abstract pieces, which are mostly focused in the back half of the gallery for this show, include several shiny, rectangular paintings. At first look, the works are puzzling, looking less like they have been painted and more like they have been shellacked. Shiferaw achieves this by stretching vinyl on a frame, applying strips of masking tape to the back, making layer upon layer of marks on the back of the vinyl with black spray paint, and finally removing the tape to reveal a sort of window. 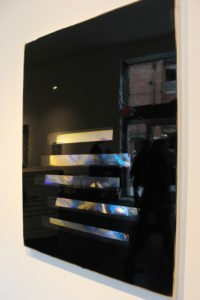 Behind this vinyl window he positions mylar or clear iridescent film, which enhance the sheen effect of the piece by refracting the light it catches at different angles. 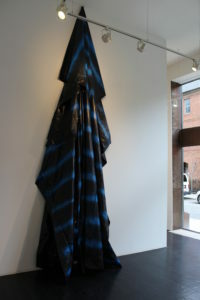 His experimentation with these materials began with the 3.5mm plastic clear or charcoal-tinted vinyl he was using for more lage-scale, robe-liked draped pieces hung against the wall from high above. Once he realized the vinyl was more heat-fast (not affected by temperature changes) than normal canvas, he began applying “gestures” to the surface, the physical element of his mark-making that he feels “liberated” him from traditional canvas. Once he had completed the works, he named them after songs by the artists he listens to, from Hip Hop and R&B to Jazz, Blues, and Reggae. He chose titles that can “have a conversation” with each other through songs that reference inequality, social structure, relationships, economy, and world happenings. “The combination of the title and new material and a new approach is almost like ‘eff history,'” he said, referencing the exclusionary tradition of Abstract Expressionism, which was mostly dominated by white males in mid-century America. These metaphysical marks gave way to another, unintentional form of mark-making: “in place of black bodies, [the works are] in these white cubes occupying space, or marking space,” he said. Shiferaw has certainly made another mark by contributing to the conversation and sense of community found within an arts district, though he didn’t realize the Short North was one until recently. Though he has called New York City home for the last six years, he’s originally from Los Angeles, where he experienced the type of neighborhood in the Downtown area that, similar to the Short North, used to be considered dangerous and has since been transformed. “I like the idea of community; that is important for a young artist,” he said. SIX PLUS ONE Featuring Tariku Shiferaw will be on view at Hammond Harkins Galleries through April 28.